In a previous post I briefly mentioned the air-raid shelters in the back of our shop where all the cardboard was stored for bonfire night. The shop in Caroline Street (now occupied by Evans, ladies clothing) backed onto Elder Lane (shown as Elder Street on the plan) and behind, facing onto Adare Street, was the Tax Office employing many people. At the outbreak of war the government commandeered the small piece of land behind the shop in order to build an air raid shelter for workers at the Tax Office, at the same time they also built a bicycle shelter. Later on in the war, in 1942, the Ministry of Works submitted a plan to build a further shelter behind the existing ones. 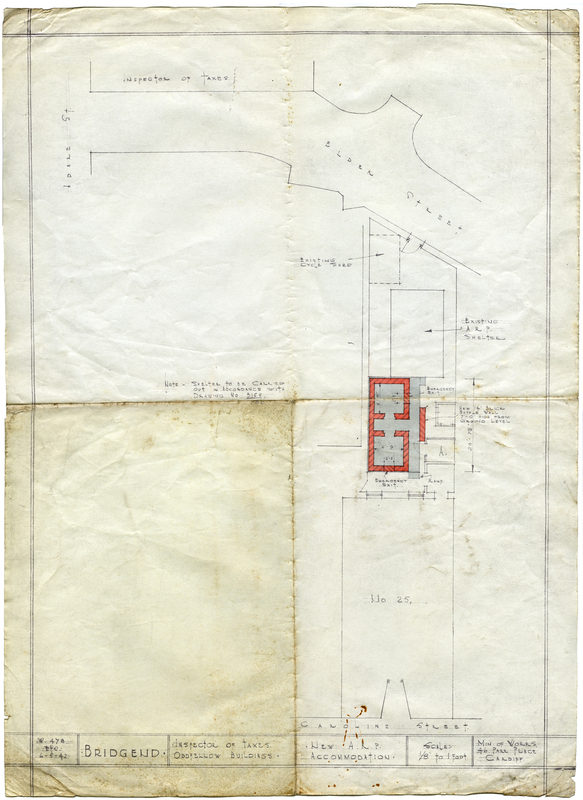 This plan survives and shows the work that was carried out and completed and this plan is reproduced below. After the war, the use of the land and the shelters reverted back to the landowner, Dunraven Estates, but with a proviso the bicycle shed could still be used for employees of the Tax Office and this use continued into my living memory although I only ever recall one person using it. Sometime in the late 1950s my father demolished the back wall of the boundary and fitted double gates to provide vehicular access to the rear of the shop, at the same time it was also necessary to remove one side wall of the first air-raid shelter so our car could fit into the small space behind the gates. In the photograph we can see in the foreground the double gates and to the extreme right is the roof of the bicycle shelter. In the middle distance are the two concrete apex roofs of the first air-raid shelter. Dominating this scene are two immense sycamore trees which, by the time of this photograph in 1980, were completely out of control. The “new” air-raid shelter can’t really be seen as it’s behind the large tree on the right. In the background can be seen the rear wall of the shop and on the skyline the Rhiw office block of Ogwr Borough Council, since demolished. Shortly before this photograph was taken my father sold the few remaining years of the lease and the new lease holder obtained planning permission to alter the shop front and to extend to the rear. Most of the rear of the shop had disappeared within a very short time, although I’m told the shelters were very resistant to being removed! Hi Mike, The Air Raid shelter was in what we knew as Elder Lane. Although there was a street sigh showing Elder Street on the side of Samuels. Thanks Nat, have amended the text accordingly!